Marriage is the topic of the day. Probably even the topic of the last few decades. Unfortunately for the church more time has been spent discussing marriage in the context of a secular culture then within the bounds of God’s covenant framework. 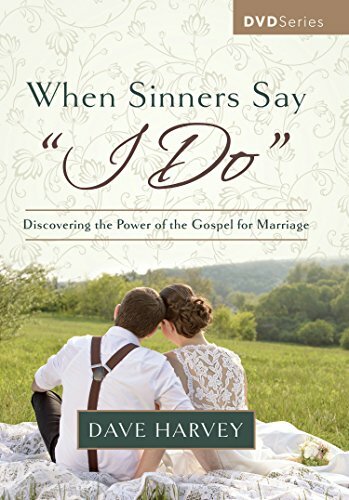 Based upon a previously published book with the same title, When Sinners Say I Do presents marriage within a distinctly Christian framework. With strong emphasis on sin, mercy, and stubborn grace Dave Henry builds up from Christian truth to marriage application. When Sinners Say I Do shines for its clarity. The stories and anecdotal experiences are minimized, imbuing greater impact upon inclusion. Harvey’s exposition of scripture is primary to each session and orderly. Aesthetically, the filmography is superior to many modern study materials. The Scripture shows up on the screen for readings without distracting. Harvey is an engaging speaker, communicating genuine care and concern while emphasizing how these fundamental Christian principals exist within the paradigm of marriage. This focus on basics is an asset but also occasionally a disappointment. In developing the presence and importance of applying Christianity’s main themes to marriage, no time was permitted to consider more specific aspects of life together. Child-rearing, financial philosophies, and uniting together in church attendance/service are just a few topics completely ignored. While these can be viewed through the lens of Christ and the Word, in what better forum than a study on Christian marriage could they be addressed? The overarching nature of When Sinners Say I Do lacked room to consider particular aspects of marriage that could use a Christian focus. Joshua: I appreciated the general ground up approach in When Sinners Say I Do. However, I think this indicative of our present churches and their lack of Biblical fundamentals. I imagine that more developed and healthy churches (and marriages) will find most of the series as a review of lessons learned. Presenting a Reformed Baptist perspective Harvey is strong on the sovereignty of God. Nonetheless, churches with covenantal convictions may not be satisfied with the lack of covenant language presiding throughout the lectures. Alaina: Believable, relatable, and supported by scripture, Dave Henry does a phenomenal job teaching and training others through a sacrament in which he is also participating. In each session a question, conviction, or encouragement led to discussion with Joshua, sparking further interest in defining and developing the necessary Christ-centric answers. In conclusion, When Sinners Say I Do is replete with Scripture and well presented. Though short, the video series highlights the fundamentals of marriage from a Christian perspective within a structure that adapts itself for Sunday School, bible studies, and personal study.